Waddup y'alls! long time no see!!! My excuse?...besides being a procrastinating MASTER! (ask my girlfriend), I've also been VERY, VERY busy with work... this here, is a video game project I've been SUPER stoked for and quite fortunate to work on! 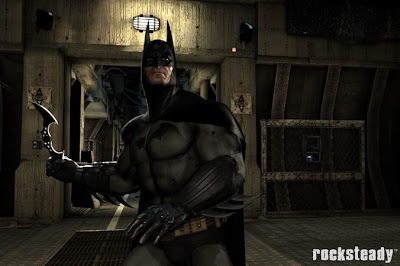 The most enjoyable part of this game has been getting to see the amazing models and renders from the VERY talented crew over at Rocksteady! These guys RULE!!! (I mean, look at the stuff!!!) It doesn't matter how hard I work on my designs IF the person modeling isn't very good, but in THIS case, these dudes just KNOCKED it out of the park!!! ...they took my ideas and just RAN with it...can't say enough good things about those guys (AND girls), Y'all RULE!!! My favorite so far? 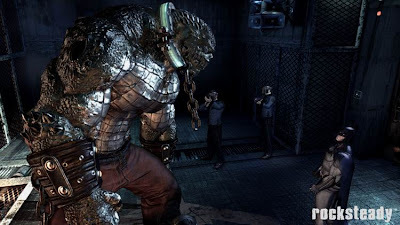 KILLER CROC!!! 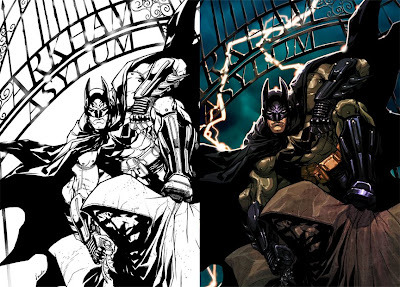 Anyway... the images above are the two covers I recently did for GAME INFORMER magazine (without all the text and stuff) AND below are a few screenshots, PLUS here's an article with some more game images, see what y'all think! 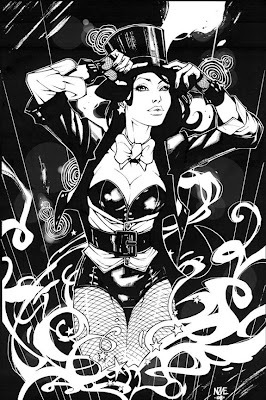 Here is a Zatanna that I did for fun right before the show. I've always been partial to her look and had so much fun doing this piece, especially tweeking her outfit a little. I can't wait to get started on another piece with her! 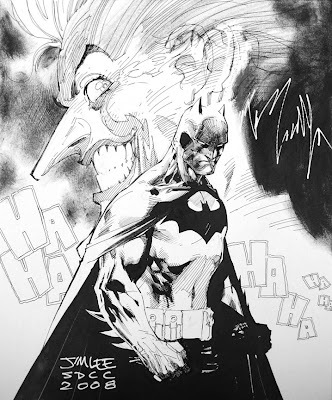 Here's the piece I did for the annual SDCC art auction which helps pay for services for the handicapped at the con. I drew it over the course of 3 days and it went for $4500. Fifth year in a row I pulled down the top bid allowing me bragging rights for another 365 days! I painted this Megatron as a bit of a companion piece to the Optimus Prime I did a few months back. My challenge was to keep a somewhat similar feel to the Prime painting (a landscape of wrecked robots at sunset) while still making them feel different in terms of character. With the Prime one, I tried to give it a bit of a solemn vibe. 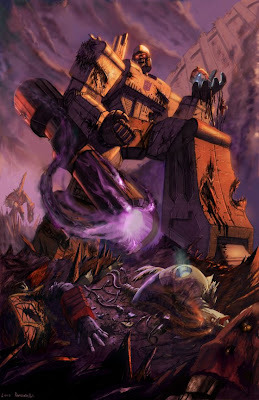 Here, I wanted it to feel like Megatron just survived a hellish battle but would gladly do it again. I’ve really been enjoying doing these Transformers pieces. I love to paint dirty, beaten up textures and these characters lend themselves to that quite nicely. I’m thinking of doing a Soundwave painting next ( because he rules), but if anyone’s got requests hit me up. 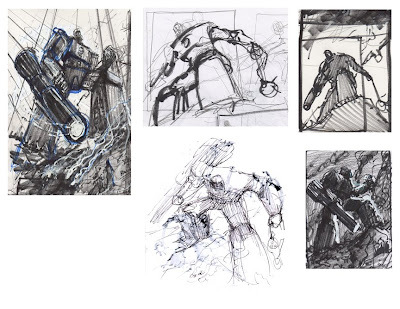 Below are some really rough thumbnail ideas I did for this image, if you’d like to check them out. I wanted to post this up for anyone interested. 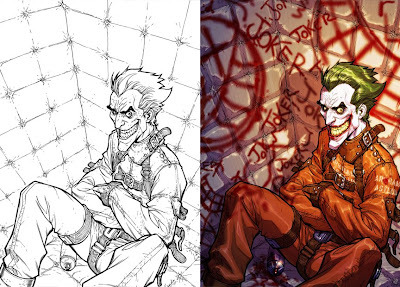 I did a few covers with Ivan Reis earlier this year. It was a small run on the Wildstorm Revelations series. I've admired Ivan's artwork for easily the last 3 or 4 years if not longer. 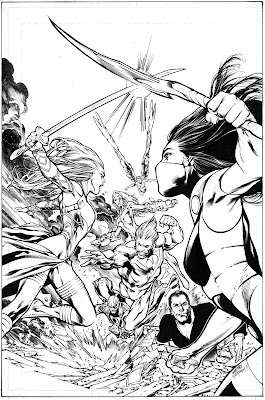 It was one of those things where I never really thought I would ink anything from him because I'd never met him, he seemed to always get great looking inks, and I just got the feeling that job was locked down as many are when it comes to penciler/ inker teams. They asked if I'd like to do some work with him and I jumped at the chance. Ends this THURSDAY at about 7:20 PM west coast time. Hello all, hoping SDCC treated everyone well. This was one of the first commissions I did there and definitely my first Princess Leia ever. It was kinda strange, because I was going to do just a random female in a Leia outfit, but it just was not working for me, so I tried to give her the Carrie Fisher look. I did a couple head sketches and then it was like, "oh-kay there she is." This was actually a real fun commission for me. Now I can't wait to draw her again. The Star Wars stuff was never anything I thought about drawing too much, but now I'm actually looking forward to doing more! I'm currently jamming on a piece with Livio Ramondelli, featuring everyone's favorite bounty hunter and some of his favorite ladies. How's it going everyone?! First off, I would like to thank all the people that stopped by to say "Hi!" in Artist's Alley. Second, I would like to say "It's finally over!" Man, that was hectic!!! It was very exciting being at my first Comic-Con. I've been here before years back when I would come and visit Carlos and the guys at the studio, but this was my first time behind the table. I have to admit though, it was fun sitting at the table drawing and talking to people. Speaking of work, here is a commission I did of Red Monika. I'm pretty happy with the piece considering I rarely use grey paper, but I just love the tones that the markers and white pencil give you. 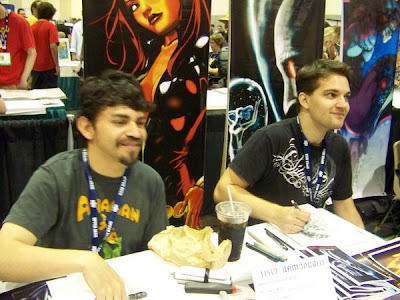 This was my first San Diego Comic-Con where I attended in a (semi) professional capacity. It was a truly exciting time for me, and it was a genuine pleasure to meet all the great people who I got to speak to in Artist's Alley over the course of the show. I had no idea what to expect, and I had a blast at the show! The one panel I got to slip away and see was for the Watchmen movie. 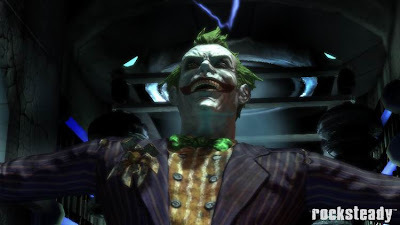 Now I know nobody actually watches the illegal leaked footage that seeps onto YouTube (cough), so let me just tell you that it looked amazing and I can't wait for the movie. I also got to meet several artists I've long admired for the first time, including Joe Quesada, John Cassaday and Marc Silvestri. I also picked up the amazingly impressive J. Scott Campbell sketchbooks, which really are worth every penny. One of my favorite random moments involves eating breakfast one morning at a hotel cafe a block away from the con. I happened to notice Damon Lindelof and Carlton Cuse (the creators of Lost) sitting at a table nearby. I couldn't resist telling them how much I enjoy the show. I also told them that I knew their time was valuable, and I would be out of their hair as soon as they revealed exactly what the smoke monster was. They declined, telling me it was too complicated to explain, but I left anyway. They'll pay. But more than anything, it was just great to meet some readers of this blog! Thanks to all you guys who stopped by, and hope to meet more of you at a show in the near future! Hi everyone. My name is Sarah Farber and I am the editorial coordinator for CMX, which is the manga line we produce here at WildStorm. I have been working here at the studio for six and a half years and in that time I have attended seven Comic-Cons and three Anime Expos. I have brought my video camera to each convention and almost three years after starting the editing process, Fantastimundo is finished. All of the footage was shot and cut by me and good friend Kris Schlesser (without whom none of this would have been possible). Anyway, I hope you enjoy it and thanks for watching!